The four short letters of 1-3 John and Jude deliver powerful messages of correct living in a wrong world and are as relevant today as they were in the first century. Written near the end of the John’s life, 1 John was meant to revive the faith, love, and hope of his readers and encourage them to renew an authentic, contagious walk with Christ. Like two siblings, 2 and 3 John are letters with unique personalities but also some striking similarities, each taking a unique approach to a single, urgent message: balance unconditional love with discerning truth. Jude, the brother of Jesus, writes with a twofold purpose: expose the false teachers that had infiltrated the Christian community, and encourage the believers to stand firm in the faith and fight for it. 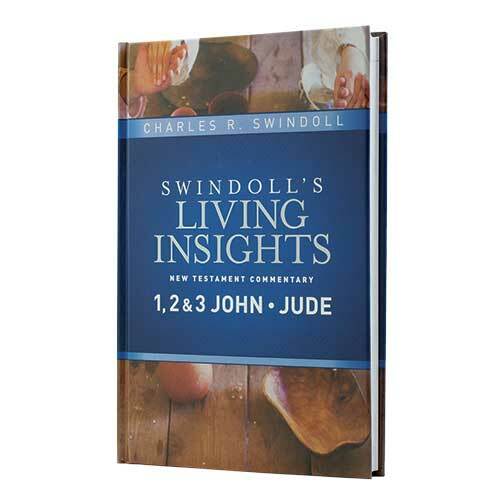 The 15-volume Swindoll’s Living Insights New Testament Commentary series draws on Gold Medallion Award–winner Chuck Swindoll’s 50 years of experience in studying and preaching God’s Word. His deep insight, signature easygoing style, and humor bring a warmth and practical accessibility not often found in commentaries.